Arsenic is a common element in the earth’s crust, natural groundwater, and even the human body. It is an odorless and tasteless semi-metal (metalloid) that is naturally present in aquifers throughout the U.S. and the world. Arsenic is typically found as an oxyanion in the environment, most commonly in the +3 and +5 oxidation states. Since 2006, the drinking water standard (maximum contaminant level, or MCL) for arsenic in the U.S. has been 10 ug/L. At concentrations above the MCL, arsenic can cause skin damage, circulatory problems, and an increased risk of cancer. Many treatment technologies have been developed and refined to remove arsenic from water, including chemical, physical, and biological processes. Typical technologies for arsenic removal are a combination of chemical and physical processes, which will be the focus of this article. Several emerging technologies will also be discussed. Lime precipitation has been used to reduce arsenic concentrations from high levels (e.g., hundreds of mg/L) to moderate levels (e.g., 1 to 5 mg/L). Precipitation is typically followed by clarification or filtration for solids removal. However, an additional process would be required to “polish” arsenic concentrations down to drinking water standards. Oxidation is a chemical process typically used in conjunction with other processes for arsenic removal. As3+ (As(III) or arsenite) is more soluble in water and less available for precipitation/adsorption reactions than its As5+ (As(V) or arsenate) relative. Accordingly, an oxidant such as chlorine, hydrogen peroxide, potassium permanganate, or ozone can be added to oxidize As3+ to As5+. A cost-effective approach for arsenic removal is coagulation and precipitation (chemical processes) followed by filtration (a physical process), which is termed coagulation/filtration (CF) in the water treatment industry. Common coagulants used for arsenic are iron salts and aluminum sulfate (alum). Alum coagulation is generally less efficient than iron coagulation, so alum should only be used in systems with low arsenic concentrations. Typical iron salts used are ferric chloride and ferric sulfate. Following coagulation, a process such as multimedia filtration with automated backwashing is typically used to remove precipitated arsenic (Figure 1). CF systems are provided by companies such as Pureflow Filtration, Kinetico, and Tonka. While CF is effective, new adsorbent materials have been developed to remove metals and metalloids such as arsenic from solution. Adsorptive media (AM) is another common technology for arsenic removal that can be used in place of or to augment CF. As with coagulants, most adsorptive media are iron-based; variations include titanium dioxide, zirconium, and other ion exchange resins (Figure 2). As with CF systems, a variety of equipment and materials suppliers are available. Reducing pH to the 5 to 7 range can enhance AM effectiveness. Iron-based AM is regarded as the industry standard for arsenic removal. It is estimated that 80 percent of utilities that remove arsenic from drinking water do so with adsorptive media, with 80 percent of the operating cost due to media replacement (Water Online, 2014). AM systems are provided by companies such as Severn Trent, Siemens, AdEdge Technologies, Pureflow Filtration, and BioteQ. 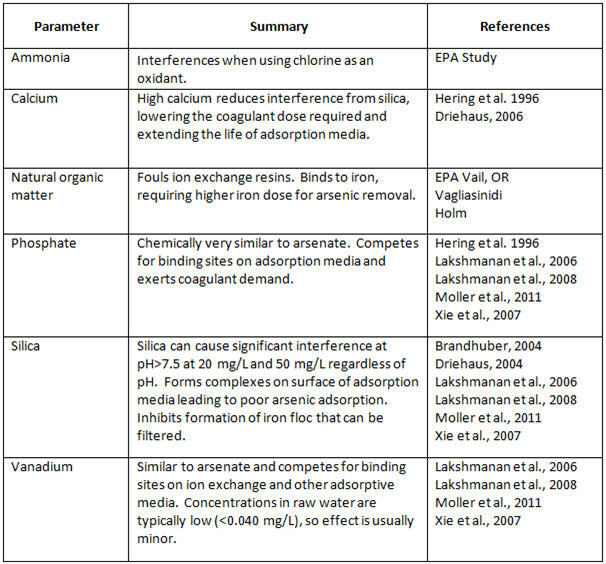 Table 1 details an extensive list of media evaluated recently for arsenic removal. The ion exchange (IX) process differs from the AM process in that IX media is meant to be regenerated periodically and reused after arsenic adsorption. IX media is typically regenerated with sodium hydroxide and sodium chloride, which creates a liquid waste containing a high concentration of arsenic. Since waste disposal may be problematic, IX is not typically used for arsenic removal. 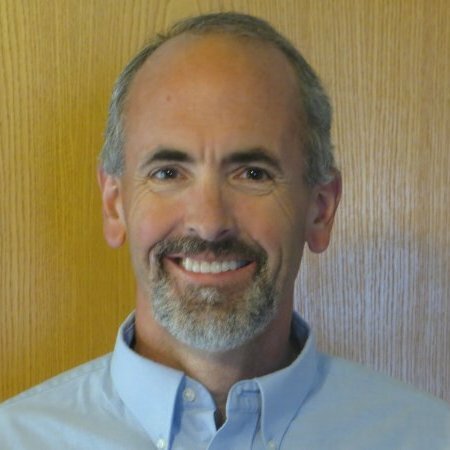 The ABMet process originally developed by Applied Biosciences of Salt Lake City, UT (now part of GE Water) uses biological sulfate reduction to precipitate arsenic and heavy metals. Nitrate, selenium, and mercury may also be removed in the process. An organic nutrient is continuously added to feed the bacteria. Biological systems for arsenic removal require a relatively long residence time, such as 4 to 8 hours. This system requires little maintenance, with the nutrient comprising most of the operating cost. ABMet has been installed at several locations in North America and Europe, treating flows up to 2 million gallons per day (MGD). 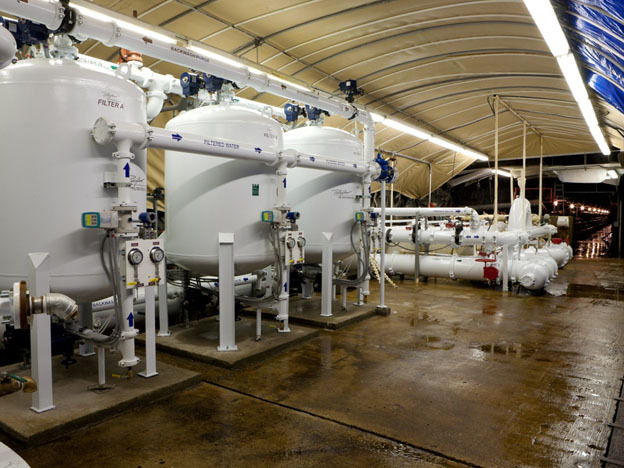 This biological process has been successful with both high-TDS (35,000 mg/L) and low-temperature (4oC) waters. Air is used as an oxidant. High temperature is not required. The iron dose and solid waste volume are less than in ferric arsenate processes. Bioscorodite is more stable than scorodite produced from conventional processes. Several innovative arsenic removal technologies, or variations of existing technologies, have been developed over the past decade. Most are aimed at providing simple, low-cost arsenic removal to developing countries such as Bangladesh and India, where naturally occurring arsenic is common in groundwater. It is estimated that over 60 million people in those two countries drink groundwater contaminated with high levels of naturally occurring arsenic. ElectroChemical Arsenic Remediation (ECAR) uses a low electrical current to create rust from iron plates in contaminated water. The rust binds to arsenic, which can then be removed from the water through settling and/or filtration. 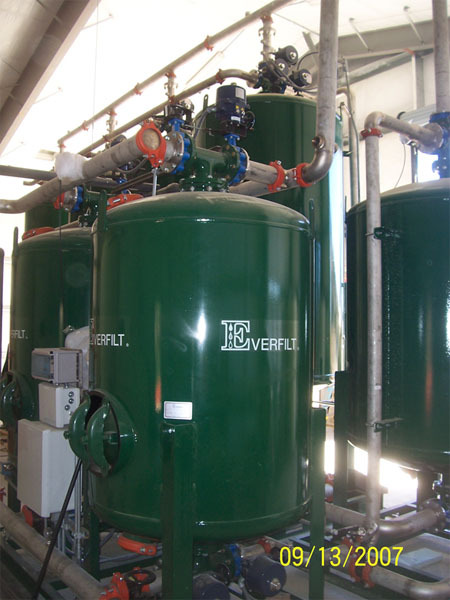 It is targeted for communities or countries that do not have the resources for standard coagulation/filtration plants. The technology was developed at Lawrence Berkeley National Labs and is currently being pilot-tested by a company called SimpleWater. The ECAR process is reportedly much less expensive than conventional technologies. Regenerating adsorptive media (AM) is another recent development. As shown earlier in this paper, several types of AM media have been used for arsenic removal for decades. Although alumina, titanium and zirconium-based media cannot yet be regenerated, iron-based media can. 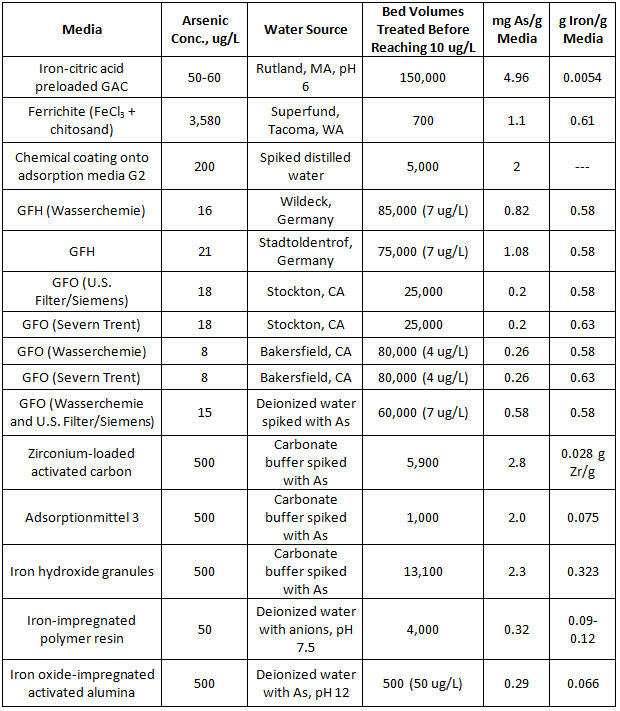 Backwashing and regenerating iron-based media, rather than replacing it, is a development being evaluated at the Twentynine Palms Water District in California (Water Online, 2014). A caustic soda solution (pH 13) is used to strip arsenic off the media. At Twentynine Palms, regenerated media has shown no signs of degradation after five years of regenerating. Each regeneration removes about 90 percent of the arsenic accumulated on the media. Operator training (a more complicated process plus safety training) and wastewater disposal are the major considerations for regenerating iron-based AM. Including wastewater disposal, the entire media regeneration process is still 60 percent less expensive than purchasing new media. Several nanomaterials have recently been developed for arsenic removal. In one technology developed by the National Institute for Materials Science, the inner walls of nanoporous substances are densely packed with a functional group that is sensitive to and selective for adsorbing arsenic (Water Online, 2012). Very low levels of arsenic can reportedly be adsorbed. A distinctive feature of the technology is that the color of the nanomaterial changes as arsenic is adsorbed. This nanomaterial is reportedly lightweight with rapid kinetics but also low-cost. 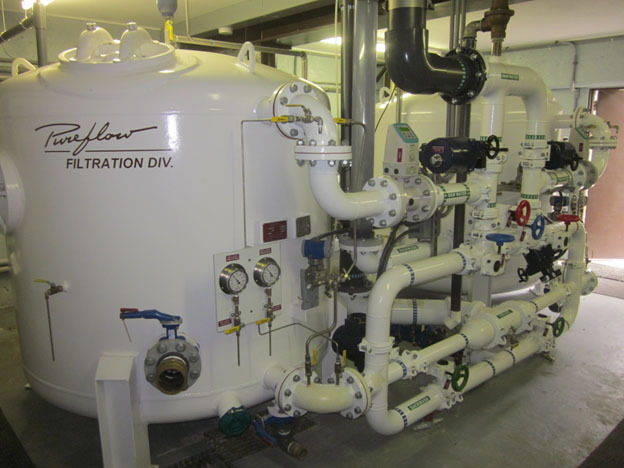 Application at both large-scale treatment plants and point-of-use systems is being explored. Another low-cost technology designed to address arsenic removal in developing countries is subterranean arsenic removal (SAR). This technology uses controlled oxidation with air and filtration to reduce arsenic to low levels. In a modified in situ process, water is oxidized above-ground and injected back into the aquifer, where ferric arsenate particles are then filtered. No chemicals are used and the sludge produced is immobilized underground. The SAR process is being used at several plants in India and one community in Washington State. Chen, W., R. Parette, J. Zou, F.S. Cannon and B.A. Dempsey, 2010. Arsenic Removal by Iron-Modified Activated Carbon. Water Research Foundation #3158, draft project report. Odell, L. and S. Perry, 2013. Arsenic Removal: Lessons Learned Since 2002. Water Online, Feb. 14th. Water Online, 2014. Next-Generation Arsenic Removal. May 23rd. Water Online, 2012. Development of Material for Quick, Simple Removal of Toxic Arsenic in Drinking Water. January 18th. For more information, contact Mark Reinsel at http://apexengineering.us.